The 1959 aerial photo taken by the Turkish Army. The Durupınar site is the name of a formation located near Mount Ararat, which was named after its discoverer İlhan Durupınar. The size, shape and location of the formation have caused it to be put forth as being the remains or resting place of Noah's Ark. Most notably, the size of the formation matches the description from the Bible fairly closely. However, most creation scientists do not regard the site as anything more than a natural formation. In the late 1970s, archeologist Ron Wyatt traveled to the site and proclaimed it to be Noah's Ark. Tests were done from 1985 until the early 1990s, with results being broadly inconclusive. However controversy has raged about the site and still does, with claim and counter-claim made by various people involved in the research. Nevertheless, even with much of the evidence called into question, the Duripinar site remains one of the best evidenced sites claiming to be Noah's Ark. 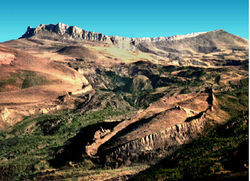 In 1987 the site was officially declared to be Noah's Ark by the Turkish Government, and dedicated as a national park. The site is now equipped with a nearby visitors center. It is located on the 'Mountains of Ararat' as described in the Bible. It is accepted as being the site of Noah's Ark by the Turkish Government. Its size is similar to the biblical description of Noah's Ark (see below). The site is surrounded by supporting evidence such as ancient local dwellings, geographic features and settlements named after the Ark story, and enormous anchor stones. Anchor stones were used in ancient times in place of anchors. The numerous stones discovered near the Duripinar Noah's Ark site are the largest ever discovered. They are over 6000 feet above sea level, 75 miles from the nearest body of water and much further from the ocean. Sub-surface radar scans and metal detecting at the site confirm the presence of iron under the surface. The formation is 157m (515 ft) long and 42m (138 ft) wide. The Bible gives the measurements in cubits, which were nominally the length from a man's elbow to the end of his fingers, but varied from 55.4cm (17.5 in) for the short Hebrew cubit to 52.3cm (20.6 in) for the long Egyptian cubit. According to the Bible, the ark was 300 cubits long, 50 cubits wide, and 30 cubits deep. If the long Egyptian cubit is used, the ark's length was 157m (515 ft) and its width was 26m (86 ft) wide. The discrepancy in the width is explained by the site's supporters as being due to the boat splaying under the weight of mud. Ribbons showing claimed grid formation in 1985. The assertion that the iron under the surface was detected in a boat-shaped grid formation. Subsequent testing did not confirm this. David Fasold's 1985-6 Noah's Ark Field Studies video is used as an illustrated of a pattern of metal being found in the site. John McCoy, a proponent of the site, has produced a video of his mini metal detection survey, the 2007 Noah's Ark Field Studies video. The late Colonel Jim Irwin has stated that he also found what appeared to be a man-made pattern of metal. M. Salh Bayraktutan (Ataturk University), John R. Baumgardner (University of California, Los Alamos) and Tom Fenner and Joe Rosetta (Geo Survey Systems, 'GSSI', the sub-surface radar company) are sometimes cited as supporting the site's claim to be man-made and a boat. 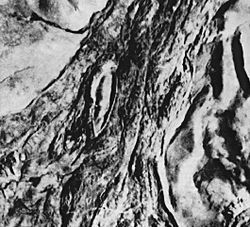 Most sources state that although these scientists were initially enthusiastic about the site, they have since stated it to be a natural formation. However Dr. Robert Michelson (Georgia Tech), Dr William Shea (Biblical Research Institute) and Turkey's leading archaeologist,  Ekrem Akurgal are still cited as advocates of the site being that of a large ship. The main proponents seem also to have diverged in their claims about the site since the 1980s. While Ron Wyatt claimed the veracity of all finds at the site until his death in 1999, David Fasold's position became that "the Ark was constructed of cemented reeds which have since decayed away." Fossilized metal rivets purported to be found at the surface are confirmed by Los Alamos Labs, UC as containing man-made aluminum and titanium. Wood remains purported to be found at the site and tested at Galbraith Labs in Knoxville, Tennessee show a sophisticated wood-layering technique. The laminated layers are held together with tree sap glue. It is proposed that this lamination may be the meaning of the Biblical 'Gopher' wood. The survey with a sub-surface radar device built by Geophysical Survey Systems Incorporated (GSSI) that charts the presence of objects below the surface was conducted in 1986 and 1987 by Ataturk University and Los Alamos Labs, University of California, to confirm the prior metal detector 'grid pattern' of 1985. The survey did not find any evidence of a pattern in the metal under the surface at all. John Baumgardner performed several scientific tests on the site after this time, such as magnetometry, ground-penetrating radar, seismic, and finally, core drilling. He claims to have disproved the hypothesis that this is Noah's Ark by these tests. The core drilling identified the layers as rock surfaces natural to the area. Although the shape of the Durupınar site formation is very compelling, it is not unique to the region. There are other similar formations nearby, which are apparently the result of solidified mudflows. Mudflows are typical occurrences at volcanic mountains, which have risen to an elevation that causes snow-pack or glaciers to form. Even minor volcanic activity will cause melting and induce erosion and subsequent deposition at the foot of the mountain. 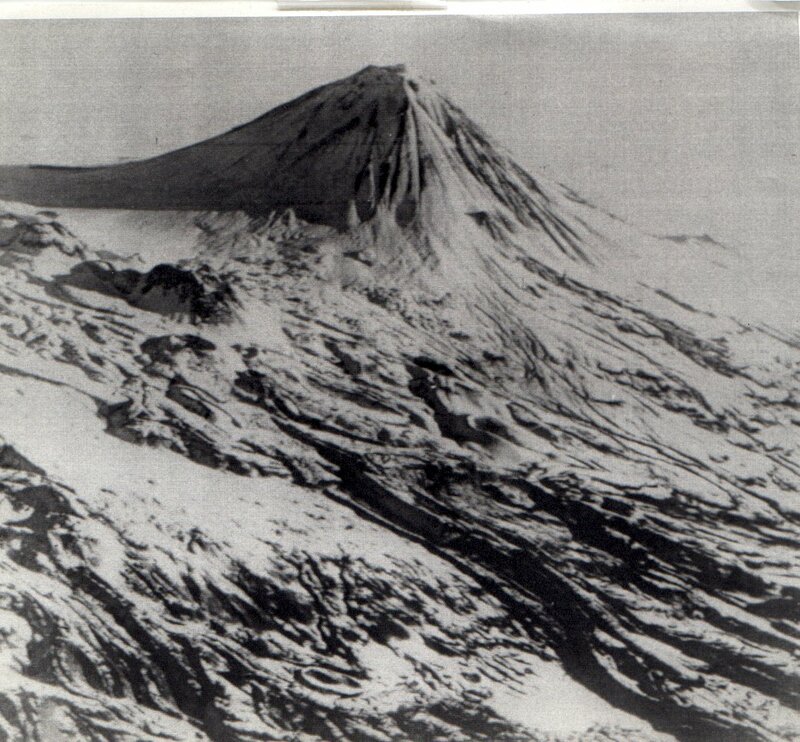 Similar episodes occurred at Mount St. Helens. In an extensive article attacking the find's validity, Andrew Snelling makes the claim that M. Salh Bayraktutan "express(es) grave doubts about the claimed artefacts and about how some of Wyatt’s ‘evidence’ actually found its way on to the site." Anchor stone found 12 miles from Duripinar site. It is claimed that the Anchor stones could be merely gravestones, and although their distinctive holes have not been explained, the holes are too close to the edge to provide sufficient strength to support their weight. Also, most of the stone have been found 16 to 22 km (10 to 14 miles) away from the formation. 1960 1959 Turkish air-force aerial photograph of the site receives publicity in Australian Pix and American Life. 1960 Survey of the site conducted by the Archeological Research Foundation. 1977 Ron Wyatt visits the site and begins promoting it. 1985 David Fasold and John Baumgardner join Wyatt in supporting the site. 1987 Sited declared to be Noah's Ark by the Turkish government, and a visitor's centre subsequently constructed. 1990 Allen Roberts visits the site and founds Ark Search to raise funds for further investigation. 1991 Roberts visits the site again, with Wyatt, and are kidnapped and held for three weeks by Kurdish guerrillas. 1992 Roberts conducts Australian lecture tour. In a publicity stunt for television, anti-creationist Ian Plimer interrupts and challenges Roberts. Sept. 1992 Creationary geologist Andrew Snelling publishes a comprehensive report on the site in Creation, documenting that it is not Noah's Ark. 1994 Plimer appears on an Australian television program with Fasold on the site. Fasold concedes that Plimer is correct. Most creationists do not believe the Durupınar site is the ark, and it is probably best to view this discovery with skepticism until a complete excavation is performed. It is most logical to assume that the ark of Noah has decomposed completely since the flood. However, if it became buried under a mudflow or glacier, it could have been petrified or preserved respectively. Unfortunately, industrious excavations are not likely to be forthcoming in this remote and hostile region. If it is still in existence, the discovery of Noah's ark may await exposure by a major natural erosion event. ↑ Morris, John. That boat-shaped rock … is it Noah’s Ark? Creation 12(4):16–19, September 1990. ↑ 2.0 2.1 2.2 2.3 Snelling, Andrew. Special report: Amazing ‘Ark’ exposé Creation 14(4):26–38, September 1992. ↑ 4.0 4.1 4.2 4.3 4.4 John D. Morris, The Search for Noah's Ark: Status 1992, Acts & Facts, 21 (9), 1992. Noah's Ark or Elaborate Fraud? Tennessee adventurers document astonishing find WorldNetDaily June 1st, 1999.